If you were to drop in at any point during The Golden Compass and watch only 30 seconds of it, you’d probably think the movie turned out pretty good. 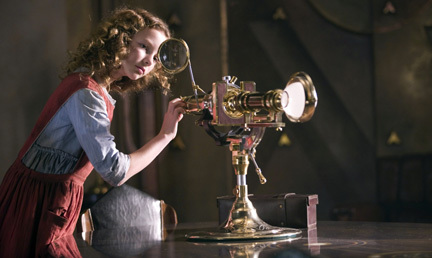 Adapted from the first book of Philip Pullman’s fantasy novel trilogy His Dark Materials, the movie is big and noisy, and it looks about right. If you take in the whole thing, however, you’ll realize that it’s been strung together in such a recklessly speedy way that even though it captures most of the narrative, it loses the spirit that made the book so well-loved. Pullman’s story is set in a place much like Europe in the early 1900s, except that witches patrol the skies, England is ruled by a dictatorial council called “The Magisterium,” polar bears conduct internecine political struggles in an island kingdom north of Scandinavia, and people’s souls reside outside their bodies in the form of talking animal companions called daemons. Laying out the workings of such a thoroughly imagined and (to many viewers) unfamiliar fantasy world is a complicated task. Writer-director Chris Weitz does a fair job with the mythology of the daemons but considerably less well with the significance of a mysterious cosmic substance called Dust. He also fails, despite throwing a lot of glitter in our eyes, to explain the workings of the mystical title object, which answers all manner of questions when they’re posed by a specially chosen child. That child is Lyra Belacqua (Dakota Blue Richards), an orphaned 13-year-old English girl who’s been raised and schooled at a university at the behest of her uncle, Lord Asriel (Daniel Craig). One day, an elegant Magisterium employee named Mrs. Coulter (Nicole Kidman) visits the college, takes a shine to the girl, and charms her into going along to help conduct some mysterious business up north. Lyra and her shape-shifting daemon Pantalaimon (voiced by Freddie Highmore) soon find that Mrs. Coulter is an abusive control freak whose business is kidnapping impoverished kids — including two of Lyra’s friends from the college town — and conducting unpleasant scientific experiments on them and their daemons. The girl escapes and resolves to rescue the imprisoned children. Not surprisingly, her quest picks up many influential friends, including a tribe of seafaring people, a bear prince in exile named Iorek Byrnison (voiced by Ian McKellen), a beautiful witch (Eva Green), and an airship pilot from the independent nation of Texas (Sam Elliott). Weitz’ personal background is promising. He’s a British-educated American with a Cambridge degree. His talent is another story, though. He worked with his brother Paul on American Pie before adapting Nick Hornby’s About a Boy to the screen. These small-scale films aren’t anything to be ashamed of, but nothing in Weitz’ track record indicates an ability to make movies on an epic scale or work with heavy amounts of special effects. The evidence of his bad fit with the material is everywhere. His action sequences are undistinguished except for Iorek’s showdown with the bear who deposed him as king, which retains the gruesome ending that Pullman wrote. The adventure-movie thrills are often given away by Alexandre Desplat’s score, which finds the composer at his bombastic worst. Weitz works frantically to shoehorn events in and seldom lets us catch our breath so that we can take in the sights in this parallel universe (and too bad — production designer Dennis Gassner comes up with some great sets). This two-hour film should have run two and a half or even three hours. 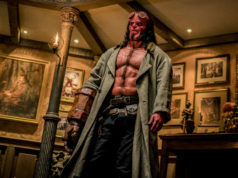 Maybe then these supporting characters wouldn’t feel like they dropped in from other movies, and maybe Iorek’s initial appearance would be as awe-inspiring as it’s supposed to be, and maybe powerhouse British actors such as Derek Jacobi and Christopher Lee would have a chance to impress us in their small roles. As it is, the only actors who make any sort of impression are Richards, who easily embodies the character’s resolve and quickness, and Kidman, who easily slips into the role of a monstrous mother figure, though you should check her out in Margot at the Wedding (opening this week in Dallas) to see her do it really well. Readers of the book may be surprised to find that this movie cuts off the story before the major plot developments and theological debate in the last few pages. (The religious conservatives are correct to claim His Dark Materials as an atheistic work, though they’re silly to think it’s a danger to anybody’s faith.) Either the filmmakers are saving the anti-religious stuff for the sequel or avoiding it altogether. We can only hope it’s the former. Scratch that. We can also hope that when the next installment rolls around, the director remembers to take some time to give this and other aspects of Pullman’s novels their due. Too much emphasis has been placed on plot and action in The Golden Compass, and too much has been skipped over. Starring Dakota Blue Richards and Nicole Kidman. Written and directed by Chris Weitz, based on Philip Pullman’s novel. Rated PG-13.